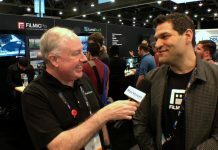 In the DJI Innovations‘ aerodrome on the show floor at NAB 2013 in Las Vegas, CEO Colin Guinn gives us an up-close look at the Phantom, an all-in-one quadcopter package that can put your GoPro camera in the air for less than the price of a fully loaded iPad. 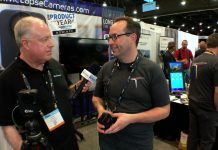 Featuring a sturdy design, easy-to-replace parts, and plenty of maneuverability, the Phantom now has a brand new gimbal that delivers “pixel perfect” stabilization. Colin shows us how it works and then takes to the air to demonstrate the Phantom.